Best used car I have ever purchased. Great interior. Plenty of room. All wheel drive. Dual sunroof. Cruise control. Audio on the steering wheel. lots of room in the cargo area. Towing. They were very good. I took my vehicle for a recall. They found another recall on my vehicle. I was given a loaner vehicle, so I would not be inconvenience. Experience was just fine. I have been going here for years for service and repair with no issue yet. Functional luxury and performance too! 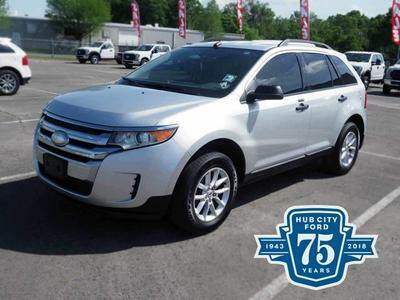 My recently acquired Ford Edge Limited is to say the least a Very Nice product. I’ve owned 16 Ford vehicles from cars to 4x4 trucks and Broncos I’ve loved em all but on this day in my life the Edge does it! It’s got so many luxury features that I am still discovering them, so many great ones are safety oriented. I looked for and found the 3.5 liter engine and could not be more pleased. Put it in sport mode and she goes. With 20” Scorpion tires handling is excellent for a vehicle with a higher profile, I just came out of a BMW 328i that was on 18x245 Michelin pilot sport tires so I am paying attention! The right engine/trans package is always important. If you get what you want in this vehicle It is worth the money! To me it is best described as a somewhat tamed sports car with better visibility, the low center of gravity will have you looking for the sweet spot in that on ramp as you switch to sport mode and just move! !